The Journal of Population and Social Studies (JPSS) is hosted at the Institute for Population and Social Research (IPSR) and run by Professor Aphichat Chamratrithirong (Editor) and Dr Kerry Richter (Associate Editor. 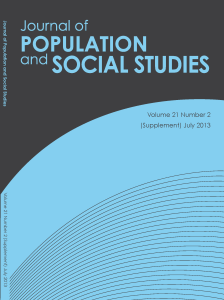 JPSS welcomes contributions from the fields of demography, population studies and other relateddisciplines including health sciences, sociology, anthropology, population economics, populationgeography, human ecology, political science, statistics, and methodological issues. Priority is given tooriginal research articles, research reports, review articles and book reviews that are of interest to the academic community, policy-makers and practitioners.